GAHS junior Cade Roberts (right) tags a Panthers runner between third and home, during Chesapeake’s 2-1 win on Wednesday in Centenary, Ohio. CENTENARY, Ohio — Regulation wasn’t enough. 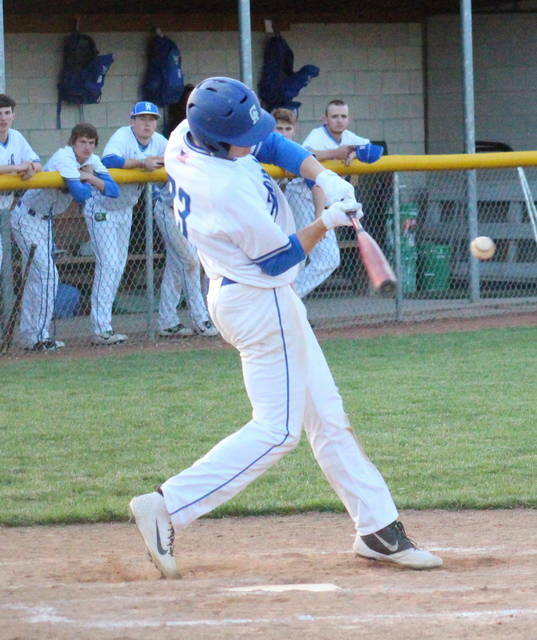 The Gallia Academy baseball team fell to Ohio Valley Conference guest Chesapeake by a 2-1 count on Wednesday at Bob Eastman Field, with the Panthers taking the lead in the top of the eighth inning. 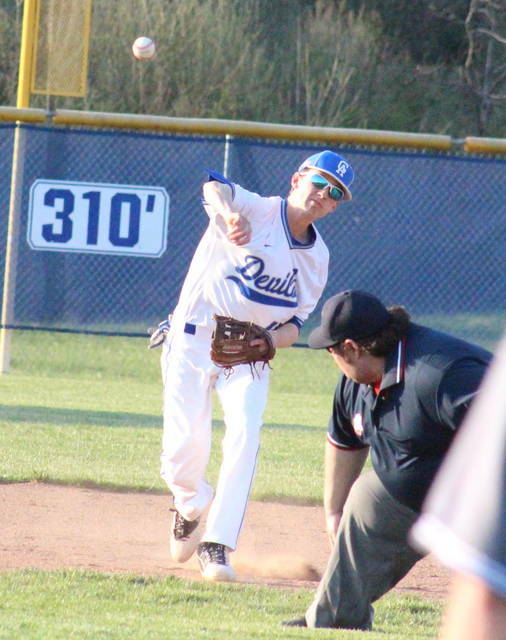 Gallia Academy (5-3, 2-2 OVC) fell behind 1-0 in the top of the first inning, as Trent Dearth singled, made it to third in an error, and then scored on a two-out Travis Grimm single. 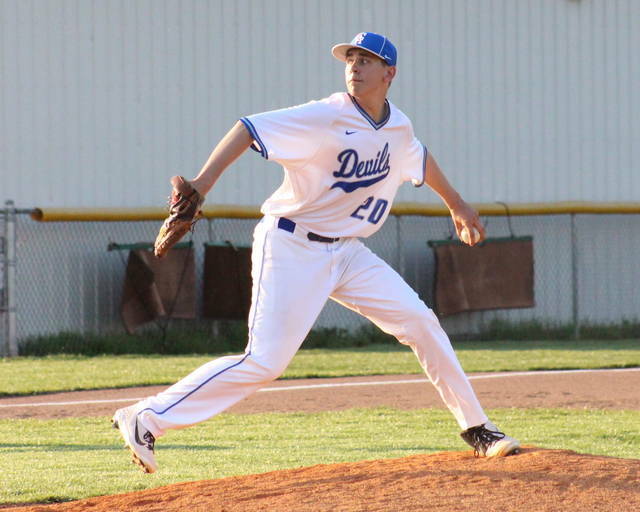 The Blue Devils left the bases loaded in the bottom of the first, but tied the game at one in the second, as Trent Johnson came home on a one-out Cole Davis double. The Panthers had two runners in scoring position with one out in the top of the third, but a pair of strikeouts surrounding a hit batter ended the frame. GAHS stranded a runner on second base in the both the fourth and sixth innings, while leaving a runner on third in the fifth, seventh and eighth. Chesapeake had a runner throw out at the plate in between third and home in the fifth inning, and didn’t make it into scoring position again until the eighth. Dearth, who led off the eighth with a single, later scored the go-ahead run on a two-out passed ball. Zane Loveday tossed a complete game and took the pitching loss for GAHS, striking out a dozen batters, walking one, and allowing a pair of unearned runs and seven hits. Austin Browning was the winning pitcher of record in 1.2 scoreless, hitless innings of relief for the Panthers, striking out two and walking one. A.J. Littreal tossed the first 6.1 innings for CHS, striking out two, walking two, and giving up one earned run on four hits. Davis doubled once and drove in a run to pace the hosts at the plate. Andrew Toler, Josh Faro and Garrett McGuire each singled once in the contest, while Johnson scored a run. Dearth led the Panthers, going 3-for-4 with a pair of runs. 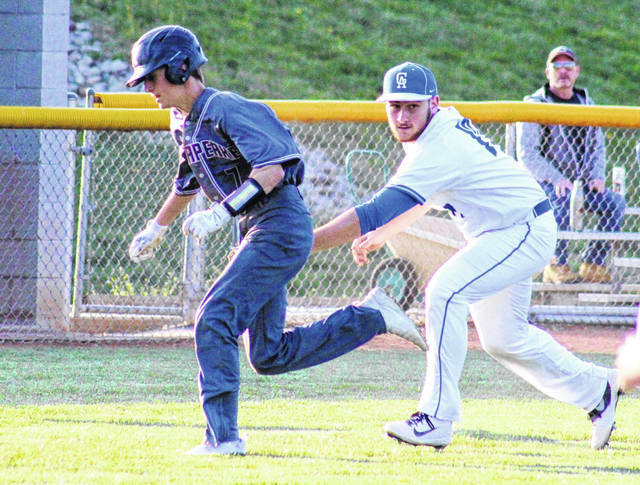 Grimm singled once and drove in a run for CHS, while Levi Best, Hayden Blankenship and Thomas Sentz came up with a single apiece. Chesapeake was responsible for both of the game’s errors, but left seven runners on base, while GAHS stranded 11. The Blue and White will look to avenge this setback when these teams meet in Chesapeake on April 26. Next, the Blue Devils are scheduled for a trip to Coal Grove on Friday.